2017 turned out to be a big year for Swedish tech, both in terms of capital raised and number of rounds. Removing Spotify’s 2016 outlier round from the equation, 2017 saw nearly twice the capital invested into Swedish tech startups. During the year, Swedish tech startups raised more than $1.2B (SEK 10.5B) across 442 deals. In total, Swedish startups engage 570+ investors. 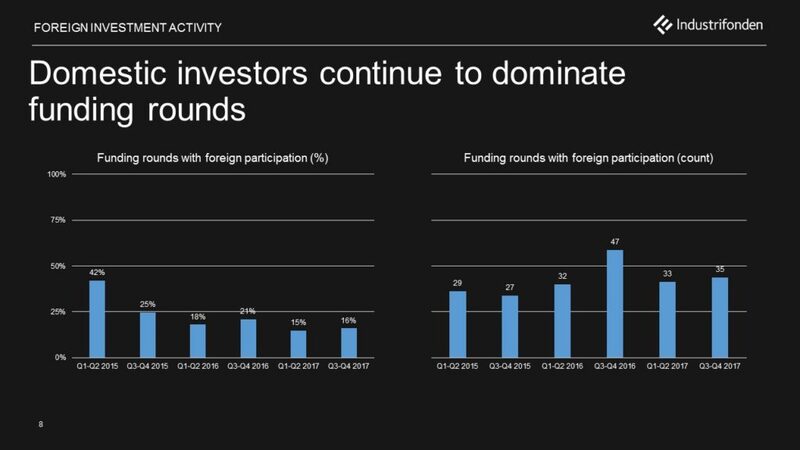 Interestingly, despite continued growth of invested capital and an upward shift of round sizes, the share of funding rounds with participation from international investors decreased. This is the lowest share since we started this tracking and points to a strong domestic funding climate, even beyond Series A rounds. 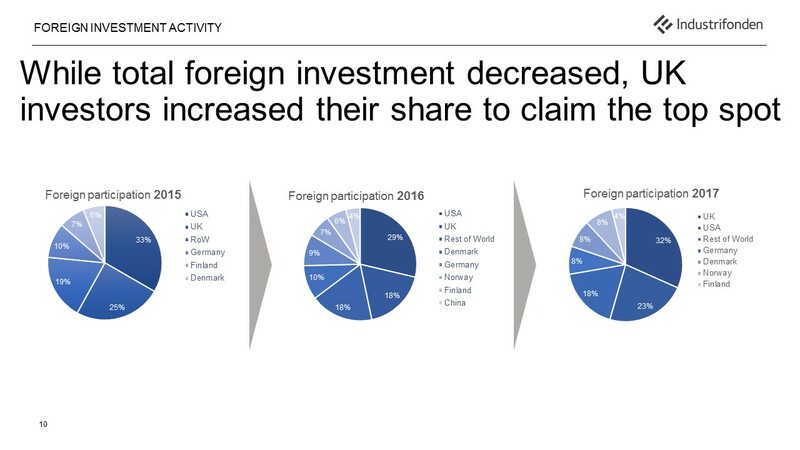 Of the international investors that did invest in Sweden, UK investors were the most bullish and claimed the top spot for the first time, racing past their American peers. Following a number of successful local tech exits and IPOs, domestic investors became increasingly bullish on Swedish tech. This was manifested by the fact that some of the largest growth rounds saw participation only from domestic investors. Top backers included Industrifonden, Almi Invest and Wellstreet. Another group of investors that showed increasing interest in tech startups was corporations. In 2017 corporate investors increased their share by nearly 60% compared to 2016 by participating in more than 10% of all funding rounds. Corporates in finance and media were the most active, which corresponds well to the sectors that so far have been particularly challenged by disruptive tech startups. Angel investors remain crucial to the ecosystem, participating in more than half of all deals and dominating in early-stage financing. In this edition, we have taken a closer look at the active angel investors. 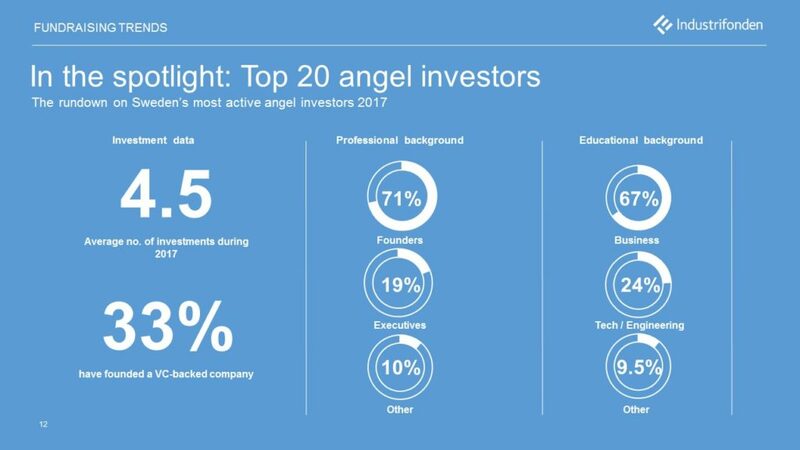 An analysis of the 20 most active angel investors in Sweden reveals that there is plenty of smart money to go around, as a vast majority of the investors are former founders. Together they are bringing experience from raising VC rounds and creating billions in exit value.